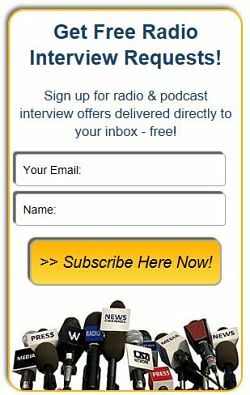 "Special Edition" Email Advertising Blasts - Radio Guest List.com - How to Get Radio Interviews and Find Podcast Guests! Want to reach our highly targeted audience of experts and authors? Or our thousands of radio producers and podcast hosts? We can help you with customized "Special Edition" email blasts to promote your book or product or service. Just email us and we'll promote your product, book, service, or availability for radio interviews to our 10,000+ radio hosts, podcasters, public relations professionals, and publicity seekers worldwide. Email blasts of your pre-written promotion to our worldwide audience currently cost $255 each and can usually be scheduled within 7 business days. Discounts apply to orders of 3 or more. If you are interested, email us at ads @radioguestlist.com. Details of what you'd like to promote - ideally including your promotional text and images. Whether you are trying to reach experts and authors who list with us OR the people who interview them (radio hosts, podcasters, journalists, etc. ), or both. Use the subject line "RGL Special Edition Request". Questions or suggestions? Email us at ads @ radioguestlist.com. Thank you for your support of our service! p.s. Are you an Expert or Author looking for more publicity and radio interviews? Check out our Featured Guest Expert Sponsorships here! They offer more detailed Guest Expert profiles, blog postings, email blasts, and more, plus they include your headshot/pictures/book cover and are optimized for search engine traffic (SEO), too!